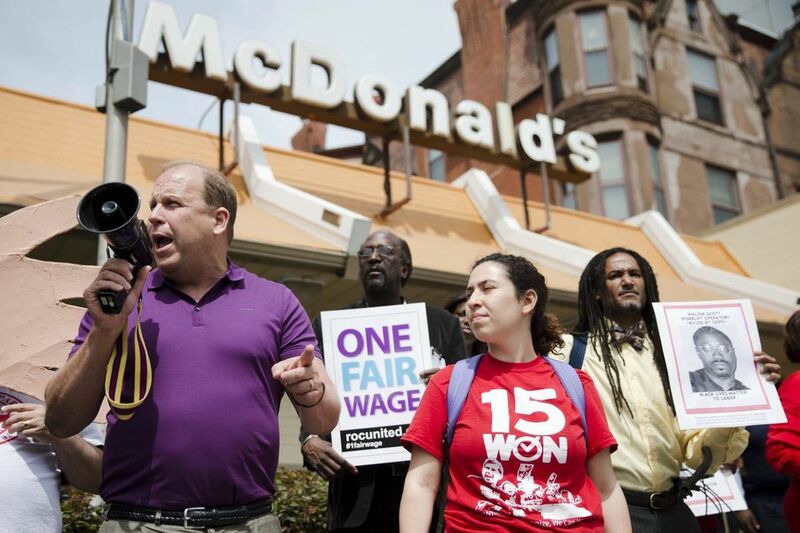 Pennsylvania State Sen. Daylin Leach (D., Montgomery) at a May Day demonstration in 2015 calling for a raise of the minimum wages to $15 an hour. Below is State Sen. Daylin Leach's statement in response to allegations that he engaged in questionable behavior with young female staffers and volunteers, from highly sexualized jokes and comments to touching they deemed inappropriate. In June, people affiliated with my political opponent started a "whisper campaign" against me. After some prodding, the media picked it up. They requested "complaints" against me which did not exist. The same reporters called my Senate staff and, according to the authors of this story, those staffers said I was a great boss and there were no problems. Still hungry for a story, the reporters spent months calling, called my friends, colleagues, former political opponents, and complete strangers. After all of this effort, this is what they've come up with. First, the humor. Anybody who knows me even a little knows I am a humorous guy. My humor is no more racy than the average person's, but to be clear, it's not pure either. Like most people, I sometimes tell or laugh at bawdy comedy. I am frequently asked to speak, including at the Press Annual Gridiron dinner, in part because of my humor. Nobody has ever complained to me. Now Aubrey Montgomery says she was offended by my humor when she worked for me 10 years ago. To me, it's a little strange. At the end of the 2008 campaign, she told me how proud she was of having worked for me. In the office, when the humor was flying, she was at least as racy as anyone else. Two years later, she came back to work for me again. She has repeatedly donated to my subsequent campaigns, and just this year, she told me that my opponent (the same one pushing the whisper campaign) "was like a big brother to her." But when he dropped out, she would again donate to me. "You don't even have to call." The first I ever heard that she had a problem was this week. As for the other allegations. It is true that sometimes I do touch people when I talk to them. A clasped forearm, a pat on the back. But never anything inappropriate or sexual. I now know that some people subjectively find such touching unpleasant. Rep. Daryl Metcalfe comes to mind. I will avoid that in the future, except with people I know extremely well. That said, the two alleged incidents that were described to me did not happen. I have brief discussions in public places literally dozens of times a day and of these incidents, I remember one not at all, and one only vaguely. But they both allegedly occurred in crowded rooms with lots of people and cameras around. I was never alone with the women involved. And I never, in any way, intentionally or unintentionally, touched them inappropriately. It did not happen. Politics is, sadly, an ugly business. And given the current atmosphere, these sorts of deep-sea fishing expeditions into everyone's past are likely to become standard. That's a shame. I worry that we risk weaponizing and trivializing a long overdue and critically important movement. There is probably nothing I can do about that. So I will go back to doing what I've always done, being a fierce fighter for women's rights and trying to protect my family from the unfortunate consequences of the profession I've chosen.